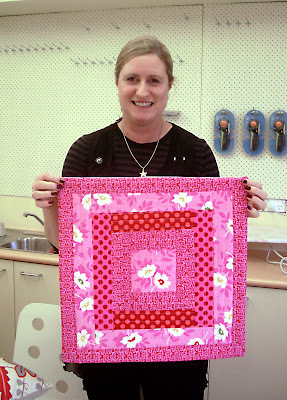 I had such a lovely morning teaching my first class for the Craft Room today. I was so chuffed that Lynne asked her husband to attend the class as her birthday gift! More places available for my class (and others) here. I had such a wonderful time today Andi... a private lesson complete with tea and Timtams=birthday bliss! Thank you for your knowledge, patience and company. A great class with a fantastic finished project at the end, sign up everyone! That cushion cover will brighten any room, it's beautiful! Congrats on your first class Andi! So, Ye Who Does That Teachering Thingo With Her Eyes Closed...Found your niche? Well done - teacher and student alike. Lynne's smile says it all... Andi's class is the place to be! Well done to Lynne and Andi. That little niece is my little girl and Aunty Lynne spoils her rotten - this is gorgeous.